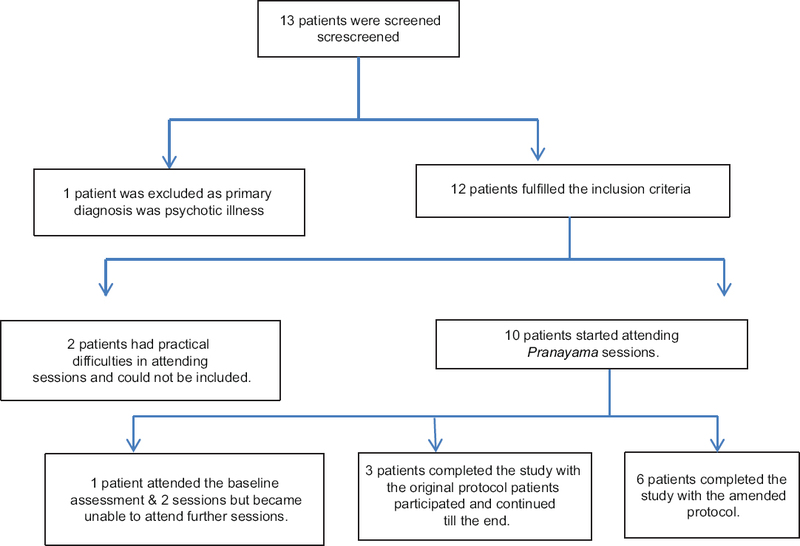 Aim: This study aims to evaluate the feasibility and effects of instruction in yogic breathing techniques (Pranayama) in patients with treatment-resistant generalized anxiety disorder (GAD) in UK secondary mental health services settings. Materials and Methods: Participants were adult primary or secondary care patients with a primary diagnosis of GAD (with or without comorbidity) and persistent anxiety symptoms of at least moderate intensity, despite prior treatment with two or more medications of proven efficacy. Patients participated in group-delivered yogic breathing training and practice for 12 weeks. Structured assessments were performed at baseline, after 1, 2, and 6 weeks of instruction, and at end-point. Participants also completed the antisaccade (emotional variant) task and startle response task at baseline and end-point. Results: At baseline, participating patients (n = 9) had moderate-to-severe anxiety symptoms and mild-to-moderate depressive symptoms, they attended 84% of offered sessions and provided positive feedback on the content and delivery of treatment. Symptom severity reduced significantly from baseline to end-point. There were greater errors on negative trials compared to neutral trials in the antisaccade task at baseline, and a significant reduction in antisaccade errors for negative stimuli as compared to neutral stimuli between baseline and end-point: but there were no significant differences in either mean heart rate or startle response between baseline and end-point. Limitations: The absence of a control group and small sample size. Conclusion: Yogic breathing techniques proved simple to learn and may be beneficial in reducing anxiety and depressive symptoms in patients with treatment-resistant GAD. Yogic breathing had no effect on autonomic arousal, but the reduction in errors to negative stimuli in the antisaccade task suggests an improvement in attention control during the intervention accompanying the reduction in symptoms. Generalized anxiety disorder (GAD) is a common mental disorder, with a 12-month prevalence of 1.7%–3.4% and lifetime prevalence of 4.3%–5.9%. A systematic review indicated yogic breathing techniques can be beneficial in healthy volunteers, in patients with physical health problems, and various mental health disorders. The uncertainty about further management in patients with GAD, who have not responded to initial treatments, and the evidence of the potential benefit of yoga-based interventions in GAD and anxiety-related conditions, encourages the investigation of yoga-based interventions in patients with treatment-resistant GAD. We therefore, aimed to explore the feasibility in practice of Pranayama breathing techniques and their effectiveness in reducing anxiety and depressive symptoms in patients with treatment-resistant GAD and to establish whether yogic breathing could target neuropsychological biases that characterize anxiety, notably hypervigilance to threatening information, and enhanced startle reactivity. The Pranayamas used in this study were Ujjayi, Anulom–vilom, Bhastrika, Kapalbhati, Bhramari, and Onkar. It is known fact that focusing on breathing reduces unnecessary thoughts and relieves symptoms of anxiety. Hence, our aim was to explore the effects of the regular practice of a few simple Pranayamas on the symptoms of anxiety. A recent study using a combination of fast and slow breathing techniques has shown significant improvement in symptoms of anxiety. This was a single-center evaluation of the potential effectiveness and acceptability of instruction in yogic breathing techniques, as an augmentation approach in a convenience sample of male and female patients (aged 18–70 years) with a primary diagnosis of Diagnostic and Statistical Manual of Mental Disorder-IV defined GAD, who had not responded to previous pharmacological treatment. A local research ethics committee approved the original protocol, and an amendment and the National Health Service trust research and development unit hosted the study. The original protocol envisaged that participants would only be recruited from local mental health services, but the amendment also allowing participant recruitment from general practice. The original protocol comprised three “phases” (retrospective, prospective, and augmentation): the retrospective phase was based on documented evidence of nonresponse to an evidence-based treatment administered for at least 6 weeks; in the prospective phase, participants underwent another evidence-based treatment for 6 weeks; nonresponding patients could then enter the augmentation phase, which comprised a 12-week course of yogic breathing instruction in addition to “treatment as usual.” The amended protocol removed the need for a prospective phase and permitted recruitment into the augmentation phase following well-documented evidence of clear nonresponse to two evidence-based pharmacological treatments, each given over at least 6 weeks. The presence of GAD and other mental disorders was determined by clinical interview and confirmed by the Modified Mini-International Neuropsychiatric Interview which was also used to identify and excluded comorbid conditions. Included patients had a primary diagnosis of GAD, but patients with primary mood disorders, primary substance misuse or dependence disorder, or antisocial personality disorder were excluded. In the original protocol, participants needed to have at least moderate severity of anxiety symptoms (≥24 on the Hamilton Anxiety Scale (HAMA) and to be at least “moderately ill” (≥4 on the Clinical Global Impression of Severity (CGI-S). Patients with coexisting depressive symptoms could be included, providing GAD was the primary diagnosis and the patient scored ≤19 on the Montgomery–Asberg Depression Rating Scale (MADRS). In the amended protocol, the requisite CGI-S score was changed to ≥3, and HAMA score to >20, in order to facilitate recruitment of patients who resembled more closely the patient group seen in routine clinical practice, in whom depressive symptoms of moderate intensity are common (thought patients with primary depressive disorders remained excluded). We examined medical records to ascertain that patients had not responded to an evidence-based psychotropic medication over at least 6 weeks. In prospective phase, specific enquiries were made regarding adverse effects, adherence to treatment was ascertained by tablet count at each visit, and “response” was defined as either a 50% reduction in HAMA score from baseline to end-point or a CGI of Improvement (CGI-I) score of 1 or 2 (i.e., “very much” or “much improved”) at the end of week 6. Patients who met either of these response criteria were not suitable for participation in the augmentation phase. Participants undertook three sessions of training and practice in week 1 and then two sessions in week 2, in groups facilitated by a trained yoga instructor. Thereafter, practice sessions were undertaken once a week in weeks 3 and 4 and once every 2 weeks between weeks 4 and 12. Each session lasted approximately 45 min, apart from two sessions in week 1, which lasted approximately 90 min. Participants were given written information about the instructed breathing techniques, advised to practice at home regularly, and encouraged to keep a log of the frequency and duration of practice. During the practice sessions, participants practiced pranayama with the instructor and were given time to share experiences with each other and the trainer afterward. Breaks and refreshments were provided during sessions when needed. The study participants were asked to provide feedback and encouraged to describe their experiences of yogic breathing techniques. During the augmentation phase, participants continued with pharmacological treatment started in the prospective phase. During the augmentation phase, participants were assessed at baseline and at the end of weeks 1, 2, 6, and 12 (end-point). Assessment at each visit included the HAMA, CGI-S, CGI-I, MADRS, Hospital Anxiety and Depression Scale (HADS), and 7-item GAD scale (GAD-7). Response was defined as 50% or more reduction in HAMA score from baseline to end-point, or a CGI-I score of 1 or 2 (i.e., “very much” or “much” improved). Symptom remission was defined as a sustained HAMA score of 7 or less, accompanied by a CGI-S score of 2 or less. In the augmentation phase, participants undertook an antisaccade task and fear-potentiated startle task at baseline and end-point. In the antisaccade task, “top-down” attention control is required to suppress (inhibit) reflexive saccades (eye movements) toward an abrupt peripheral visual stimulus and instead generate a voluntary saccade in the opposite location (antisaccade). The antisaccade task provides two distinct performance measures: performance effectiveness, measured by the proportion of trials on which participants are unable to successfully make antisaccades (i.e., error rate), and processing efficiency, measured by the time required to successfully program and make correct saccades. We used a modified version known as the “emotional antisaccade task,” in which emotional stimuli are used as visual targets, and for which test–retest reliability is high (r's >0.70 in our emotional variant). Eight negative and eight neutral images were selected from the International Affective Picture set on the basis of normative valence ratings (scale – −4 to + 4) and arousal ratings (0–8; negative images: Mean valence = −3.1 and mean arousal = 5.8; neutral images: Mean valence = 1.2 and mean arousal = 2.9). Images subtended 8 × 5.5 visual deg (at 57 cm). On each trial, an instruction word (either “towards” or “away”) was presented at a central fixation point for 2000 ms. At 200 ms following word offset, the picture stimulus was presented for 600 ms (6° to the left or right of central fixation). On prosaccade (“towards”) trials, participants were required to look toward the picture and on antisaccade (“away”) trials to look away from it (i.e., to shift gaze to the opposite side of the screen). Images were presented six times (balanced across conditions) throughout 96 fully randomized experimental trials. Participants completed eight practice trials requiring pro- or anti-saccade movements to a peripheral yellow rectangle. To increase task demand on each trial, participants classified the direction of a small arrow (→ or ↓) presented at 50 ms following picture offset (arrow-picture location congruent on 50% of trials per trial type). The mean intertrial interval (ITI) was 1000 ms (range 750–1250 ms). Stimuli were presented using (Inquisit 2 Computer software, Millisecond Software, Seattle, WA, USA). Horizontal eye movements were measured by electrooculography and sampled at 1000 Hz (MP150-amplifier and AcqKnowledge-3.8.1 software, Biopac-Systems, Goleta, CA). Data analysis involved manually scoring saccade direction and latency using Acqknowledge software. Saccade accuracy and latencies for correct saccades were entered into separate repeated-measures analysis of variance (ANOVA) with time (baseline vs. end-point), trial type (pro- vs. anti-saccade), and image valence (negative vs. neutral) as independent variables. The startle reflex is a set of musculoskeletal contractions, regarded as a behavioral interrupt preparing an organism for action: it is significantly increased in the presence of an aversive conditioned stimulus. The fear-potentiated startle paradigm assesses the degree to which an eyeblink reflex to a probe (a sudden burst of noise) is enhanced by the presence of aversive threat stimuli. It has high test–retest reliability (α >0.96). Participants were instructed to look at a central fixation cross-presented for 1000 ms. Thereafter, a visual stimulus was presented for 4000 ms. While presenting the visual stimulus (negative and neutral), the participant received an auditory startle probe (96 dB for 50 ms with near instantaneous rise time) for 3000 ms or 200 ms after picture onset. This was followed by an ITI of 11 ms (total trial length-16 s). Physiological measures at baseline were recorded and participants were first familiarized with acoustic stimuli by presenting three probes at an interval of 20 ms, which were discarded from the analysis. Data distributions were checked for normality, entered into a 2 × 2 repeated-measures ANOVA that examined the effect of picture valence (negative vs. neutral) and time (baseline vs. end-point) on eye-blink startle response magnitude and were analyzed with ANOVA to examine the intensity of startle responses to negative and neutral visual stimuli at baseline an end-point. Thirteen patients were screened for potential participation, of which 12 fulfilled inclusion criteria and provided consent [Figure 1]: Two patients envisaged practical difficulties in attending regular sessions and could not be included and another withdrew from the study after attending two sessions. Nine patients (7 women and 2 men: age range 23–62 years and symptom duration 0.5–20 years) completed the augmentation phase: 3 patients treated in accordance with the original protocol (2 receiving duloxetine and 1 receiving pregabalin, in the prospective phase), and 6 patients treated in accordance with the amended protocol. The nine participants attended 83 of 99 (84%) possible session visits; attendance was highest in week 1 (89%, 100%, and 100% for the first, second, and third sessions, respectively), compared to 67% attendance in the final session. Observer-rated scales included the HAMA, MADRS, CGI-S, and CGI-I. We ran both parametric and nonparametric tests, which showed similar and significant improvements. Overall illness severity reduced from baseline to end-point [Table 1], reflected in a statistically significant (P = 0.001) decline of mean CGI-S scores from 4.8 at baseline to 2.4 at week 12. The reduction in symptom severity was accompanied by an overall clinical improvement, reflected in a significant (P = 0.001) change in CGI-I scores (where lower scores indicate greater improvement) from 3.7 at week 1 to 2.1 at week 12. Anxiety symptom severity, reflected in mean HAMA scores, declined significantly (P = 0.001) from 25.4 at baseline to 14.8 at end-point, there were similarly significant (P = 0.001) reductions in severity of psychic and somatic anxiety symptoms. Depressive symptom severity declined significantly (P = 0.048) with mean MADRS scores of 16.9 at baseline and 12.7 at end-point. Patient-completed scales included the HADS and GAD-7. There was a significant (P = 0.001) decline in mean score on the GAD-7, from 16.3 at baseline to 10.1 at end-point. Mean HADS scores declined significantly (P = 0.002) from 26.2 at baseline to 20.1 at end-point, with similarly significant declines in severity of anxiety (HADS-A, P = 0.019) and depression (HADS-D, P = 0.018). Two patients met preset criteria for response, HAMA scores declining by more than 50% from baseline to end-point; in 6 participants, HAMA scores were reduced by 40% or more. The patient who had little (17.8%) reduction in HAMA score from baseline reported that they had experienced considerable difficulties in practicing breathing. Nine patients completed baseline antisaccade and fear-potentiated startle tasks, but baseline data for two participants could not be retrieved; eight patients completed the tasks at end-point, but comparative data (baseline and end-point) are available for only six patients. A within-subject comparison with ANOVA using three variables (instruction, valence, and time) with two levels each was performed. The levels for instruction variable were prosaccade and antisaccade; for valence, they were negative and neutral stimuli; and for time were baseline and end-point. Participants were compared along various variables and levels. Two significant effects were observed. First, a significant interaction between valence and time (F [1, 5] =7.50, P = 0.041) which was characterized by greater errors on negative trials compared to neutral trials at baseline, but with no difference between negative and neutral trials at follow-up [Figure 2], that is, errors to negative pictures were reduced over time. Second, a significant effect of instruction was observed (F [1, 5] = F 13.41, P = <0.001), indicating that participants made significant greater errors on antisaccade than on prosaccade trial. Eight participants provided feedback on the intervention. One commented on the timing of yogic breathing sessions, saying she found it difficult to attend morning sessions. Others volunteered to write about their own experiences of the yogic breathing trial. Some participants reported feeling quite skeptical during the initial weeks of the study, but their confidence grew as they begin to experience benefit. Participants described feeling “more in control,” noting “anxiety doesn't feel debilitating anymore.” One participant reported marked increases in confidence, mindfulness, and spirituality; greater ability to relax; and the desire to recommend yogic breathing techniques to others. Three participants returned to paid employment, another was able to secure a long-desired job, and another became able to contemplate a return to work, having been unable to do so for many years. Limitations include the small sample, absence of a control group, and short duration. Furthermore, a single assessor in regular contact performed assessments with patient participants, which may have resulted in nonspecific but therapeutic effects. Despite these drawbacks, we observed a significant improvement in anxiety symptoms after the intervention, accompanied by reduced eye movement errors in response to negative images, consistent with improved attentional control. The yogic breathing techniques adopted in this study proved not especially difficult to learn but required regular practice and continuing commitment. Participants were skeptical about the prospect of benefit and experienced some initial difficulty in practicing techniques, some of this due to anxiety symptoms. The study was designed so that participants had the opportunity for more intensive practice with the yoga trainer during the first 2 weeks. Participants reported they started practicing more regularly after noticing some improvement in symptoms. Encouraging them to keep a practice diary and to join discussions after practice sessions may have helped them continue with regular individual practice. The outcome measures included subjective and objective assessments of the severity of anxiety and depressive symptoms and of overall illness severity and improvement. Significant improvements were seen in scores on all outcome measures. There was a significant reduction in anxiety symptoms after 12 weeks, with improvements in psychological and somatic anxiety symptoms and there was an accompanying significant reduction in depressive symptom severity. As anticipated, participant performance on the antisaccade task was poorer than on the prosaccade task, which is consistent with previous studies (for example,). Moreover, there was some evidence that errors in response to negative images reduced at follow-up. The magnitude of the startle reflex did not decrease over time, contrary to the expectation that the magnitude of the blink reflex would reduce with a reduction in anxiety symptoms, though this finding accords with that from an earlier study in which experimental increases in anxiety (via carbon dioxide inhalation) did not increase startle magnitude. However, neuropsychological findings should be considered with caution given the small sample size. The exact physiological mechanisms underlying the effects of Pranayama remain unclear, but models have been proposed based on findings of previous investigations. A neurophysiological unifying model postulates that yogic breathing exerts its influences by strengthening, balancing, and stabilizing the autonomic and stress response system, decreasing chemoreflex sensitivity, improving the baroreflex response, shifting to parasympathetic dominance through vagal stimulation, balancing of cortical areas by thalamic activity, inhibiting cortical areas involved in executive functions (for example, those underlying anticipation, planning, and worrying), and activation of the limbic system and through increased release of prolactin and oxytocin, thereby enhancing feelings of calmness and bonding. This exploratory study in patients with treatment-resistant GAD indicates that instruction in yogic breathing techniques proved simple and feasible in practice; groups of patients can receive instruction from a single trainer, so this intervention has potential for use in primary and secondary medical care settings. Instruction and use of the techniques were accompanied by reductions in anxiety and depressive symptoms, so yogic breathing has potential utility in managing depression and other conditions in which anxiety and depressive symptoms are prominent, but larger studies with adequate control groups are needed before yogic breathing could be recommended for clinical practice. Wittchen HU, Jacobi F, Rehm J, Gustavsson A, Svensson M, Jönsson B, et al. The size and burden of mental disorders and other disorders of the brain in Europe 2010. Eur Neuropsychopharmacol 2011;21:655-79. Wittchen HU, Jacobi F. Size and burden of mental disorders in Europe – a critical review and appraisal of 27 studies. Eur Neuropsychopharmacol 2005;15:357-76. Tiwari N, Baldwin D. Yogic breathing techniques in the management of anxiety and depression: Systematic review of evidence of efficacy and presumed mechanism of action. Mind Brain J Psychiatry 2012;3:24-31. Jain V, Sharma J. Effect of Yogic Intervention: Pranayama on Anxiety & Depression. International Journal of Indian Psychology 2017;4:ISSN:2348-5396 (e), ISSN:2349-3429 (p), DIP:18.01.053/20170403. Sheehan DV, Lecrubier Y, Sheehan KH, Amorim P, Janavs J, Weiller E. et al. The Mini International Neuropsychiatric Interview. 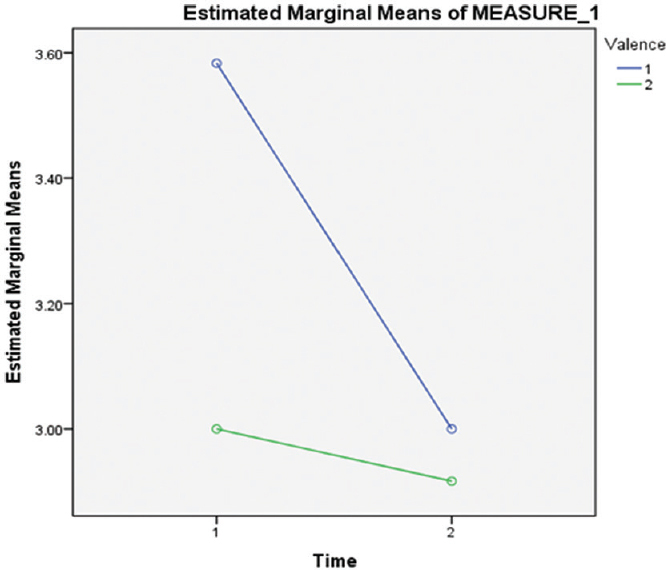 The development and validation of a structured diagnostic interview for DSM-IV and ICD-10. J Clin Psychiatry 1998;59:22-3. Guy W. Clinical Global Impression. ECDEU Assessment Manual for Psychopharmacology, revised National Institute of Mental Health, Rockville, MD. 1976. Ainsworth B, Garner M. Attention control in mood and anxiety disorders: Evidence from the antisaccade task. Hum Psychopharmacol 2013;28:274-80. Lang PJ, Bradley MM, Cuthbert BN. International affective picture system (IAPS): Affective ratings of pictures and instruction manual. Technical Report A-8. University of Florida, Gainesville, FL; 2008. Brown JS, Kalish HI, Farber IE. Conditioned fear as revealed by magnitude of startle response to an auditory stimulus. J Exp Psychol 1951;41:317-28. Lang PJ, Davis M, Ohman A. Fear and anxiety: Animal models and human cognitive psychophysiology. J Affect Disord 2000;61:137-59. Flaten MA. Test-retest reliability of the somatosensory blink reflex and its inhibition. Int J Psychophysiol 2002;45:261-5. Ainsworth B, Marshall JE, Meron D, Baldwin DS, Chadwick P, Munafò MR, et al. Evaluating psychological interventions in a novel experimental human model of anxiety. J Psychiatr Res 2015;63:117-22. Pinkney V, Wickens R, Bamford S, Baldwin DS, Garner M. Defensive eye-blink startle responses in a human experimental model of anxiety. J Psychopharmacol 2014;28:874-80. Brown RP, Gerbarg PL. Sudarshan kriya yogic breathing in the treatment of stress, anxiety, and depression: Part I-neurophysiologic model. J Altern Complement Med 2005;11:189-201.